Wandering the grounds of the hacienda, you are likely to come upon pastoral scenes like this one, as well as a lake and a 6-hole golf course. Want to splurge…and splash? 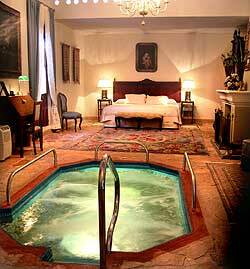 Hacienda El Carmen even has a room with a built-in Jacuzzi. 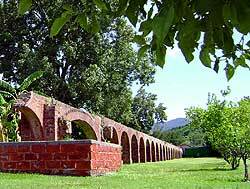 El Carmen is a grand and glorious hacienda originally built by the Carmelite Monks over 300 years ago to finance Guadalajara’s famous Convento del Carmen. 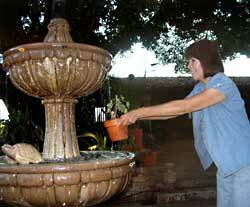 Susy Pint shows the easy way to water a flower pot at one of the Hacienda's many fountains. An old painting at the Hacienda comments on the Indians and the Church...from the monks' point of view, of course. Remains of an aqueduct on the grounds. 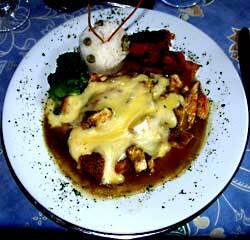 "The food: It's simply perfect!" I think this is a statue of Monica's mother...is that right, Monica? 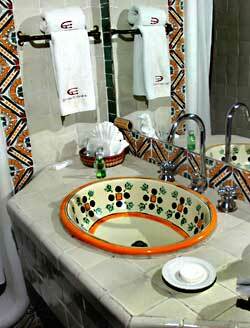 Even a sink is something special at El Carmen. "A huge night sky with unimaginably bright stars..."
I am writing these words on a comfortable sofa inside one of the magnificent arched porticos of Hacienda El Carmen, which is located only 50 kilometers due west of Guadalajara and reachable in an hour and a half from Lake Chapala. Hundreds of turtle doves, great kiskadees, grackles and robins are singing in the huge rubber tree shading the courtyard in front of me, while the soothing melodies of Antonio Bribiesca’s guitar play in the background. 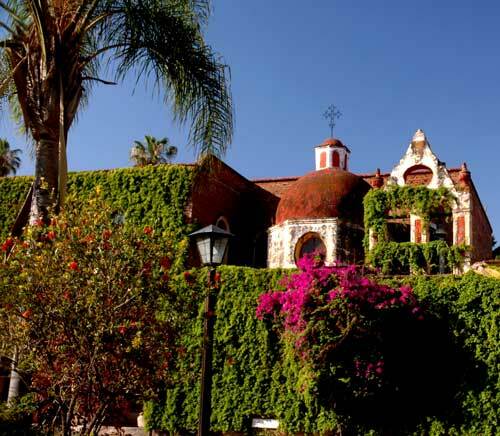 This venerable hacienda is now a hotel, a spa, a gourmet restaurant and a historical monument all in one. This morning we had the pleasure of breakfasting with Mónica Baeza who grew up in the hacienda and in 1996 took charge of running it. We were, of course, curious about the history of the place. When we asked Mónica about it, her eyes lit up. 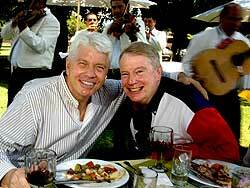 “Would you believe that this hacienda was built by Carmelite monks? 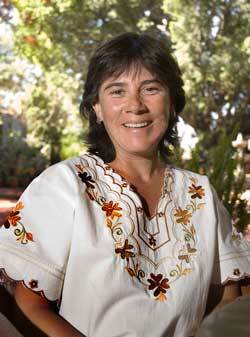 It dates back to the 16th century when the Spanish Crown bequeathed the land to one Francisco Merodio de Velasco. It stayed in the family for generations until around 1705, when Francisca Figueroa, a widow with no children, decided to give it to the monks, who, in fact, are the ones who constructed the main buildings and that beautiful courtyard out there. The Prior, however, did not want to turn it into a monastery. 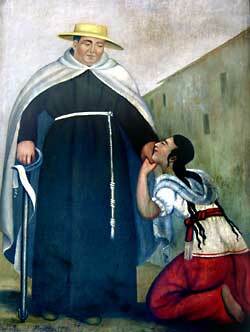 Instead, he sent the earnings from the cattle and crops to Guadalajara to finance the construction of the famous Convento del Carmen. Back in those days, this finca (farm) was huge. It had 22,000 hectares on which they produced corn, wheat, oats, sugar cane, mezcal and sorghum, just to name a few things. Today Hacienda el Carmen has “only” 160 hectares of farmland where they raise sugar cane and corn and specialize in growing large, beautiful bell peppers for exportation. What can you do at the hacienda? Plenty. Just start wandering and you’ll come across cool, shady courtyards with bubbling fountains, wide, wide, stretches of green (including a six-hole golf course), the remains of a long, graceful aqueduct and a small lake where you can go swimming and bathing with the ducks or try sneaking up on the iguanas sunning themselves along the shore. Wherever you go, whatever corner you turn, you’ll run into relics of the hacienda’s long history, now tastefully transformed into objets d’art, whether old wagon wheels, brightly colored ceramics, ancient paintings or even a life-size wooden statue of St. Francis of Assisi, dating back to the days when brown-robed monks glided along the corridors. Big attractions, of course are the massages, Jacuzzis, facials, etc. for which the hacienda’s spa is now famous. There are also all kinds of “little attractions” everywhere you turn: monogrammed towels, bathrobes and slippers, a shower as plentiful as Niagara Falls, chirping crickets under a huge night sky with unimaginably bright stars, the kind of sky you can only find far away from the hustle and bustle of the city. 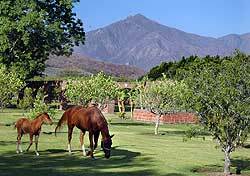 To me, the most surprising thing about Hacienda El Carmen is that they are not charging a fortune as are so many other haciendas. During the week, the price for a double room is US$ 130. This price does not include breakfast or spa services, but it does get you on the grounds and allow you to enjoy the place. 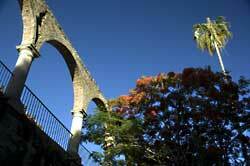 If you’re interested in visiting Hacienda El Carmen, take a look at the Calendar on their website. They have special events like musicians in the moonlight on certain nights or imaginative discounts. 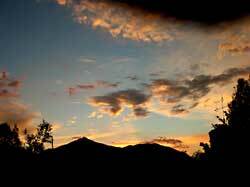 For example, “Scorpios get a 50 percent lodging discount from November 4 to 6, if they bring along their birth certificate and anyone named Lupita (Guadalupe) gets a free back massage between Dec. 9 and 12, again with birth certificate in hand. You can see for yourself how beautiful this venerable landmark is by checking out my video on YouTube. From Guadalajara: Take Avenida Vallarta and then highway 15 (Nogales and Tepic) west for 25 kilometers to highway 70 which heads southwest towards Ameca. Now go about 18 kilometers and you’ll come to an overpass and turnoff to Tala. From Ajijic: Take the Circuito Sur from the airport road (Cajititlán-Tlajomulco-Tala) to the same overpass. Now go 1.4 kilometers west where you’ll see a huge sign reading El Refugio and a much smaller but far more important sign saying Teuchitlán. Turn right and drive 13 kilometers to Teuchitlán. Keep going west another 6 kilometers and turn left at a sign reading Hacienda El Carmen. After another 9.5 kilometers you’ll see the Hacienda on your right. Driving time from Guadalajara’s western Periférico is one hour and from Ajijic (via the Circuito Sur) it’s just one hour and a half. 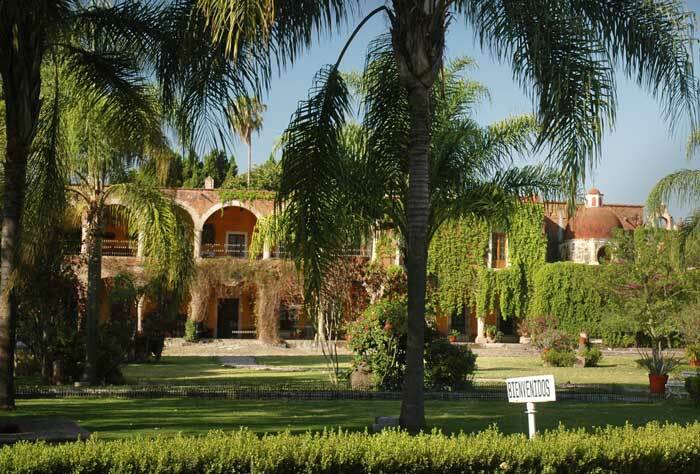 Parts of this article first appeared on Mexconnect, where you can see many more pictures of this beautiful hacienda.